Pulmonary edema is a condition in which fluid accumulates in the lungs, usually because the heart's left ventricle does not pump adequately. The build-up of fluid in the spaces outside the blood vessels of the lungs is called pulmonary edema. Pulmonary edema is a common complication of heart disorders, and most cases of the condition are associated with heart failure. Pulmonary edema can be a chronic condition, or it can develop suddenly and quickly become life threatening. The life-threatening type of pulmonary edema occurs when a large amount of fluid suddenly shifts from the pulmonary blood vessels into the lung, due to lung problems, heart attack, trauma, or toxic chemicals. It can also be the first sign of coronary heart disease. In heart-related pulmonary edema, the heart's main chamber, the left ventricle, is weakened and does not function properly. The ventricle does not completely eject its contents, causing blood to back up and cardiac output to drop. The body responds by increasing blood pressure and fluid volume to compensate for the reduced cardiac output. This, in turn, increases the force against which the ventricle must expel blood. Blood backs up, forming a pool in the pulmonary blood vessels. Fluid leaks into the spaces between the tissues of the lungs and begins to accumulate. This process makes it more difficult for the lungs to expand. It also impedes the exchange of air and gases between the lungs and blood moving through lung blood vessels. Most cases of pulmonary edema are caused by failure of the heart's main chamber, the left ventricle. It can be brought on by an acute heart attack, severe ischemia, volume overload of the heart's left ventricle, and mitral stenosis. Non-heart-related pulmonary edema is caused by lung problems like pneumonia, an excess of intravenous fluids, some types of kidney disease, bad burns, liver disease, nutritional problems, and Hodgkin's disease. Non-heart-related pulmonary edema can also be caused by other conditions where the lungs do not drain properly, and conditions where the respiratory veins are blocked. A doctor can usually diagnose pulmonary edema based on the patient's symptoms and a physical exam. Patients with pulmonary edema will have a rapid pulse, rapid breathing, abnormal breath and heart sounds, and enlarged neck veins. A chest x ray is often used to confirm the diagnosis. Arterial blood gas testing may be done. Sometimes pulmonary artery catheterization is performed to confirm that the patient has pulmonary edema and not a disease with similar symptoms (called adult respiratory distress syndrome or "noncardiogenic pulmonary edema"). Pulmonary edema requires immediate emergency treatment. Treatment includes: placing the patient in a sitting position, oxygen, assisted or mechanical ventilation (in some cases), and drug therapy. The goal of treatment is to reduce the amount of fluid in the lungs, improve gas exchange and heart function, and, where possible, to correct the underlying disease. To help the patient breathe better, he/she is placed in a sitting position. High concentrations of oxygen are administered. In cases where respiratory distress is severe, a mechanical ventilator and a tube down the throat (tracheal intubation) will be used to improve the delivery of oxygen. Non-invasive pressure support ventilation is a new treatment for pulmonary edema in which the patient breathes against a continuous flow of positive airway pressure, delivered through a face or nasal mask. Non-invasive pressure support ventilation decreases the effort required to breath, enhances oxygen and carbon dioxide exchange, and increases cardiac output. Edema — Swelling caused by accumulation of fluid in body tissues. Ischemia — A condition in which the heart muscle receives an insufficient supply of blood and slowly starves. Left ventricle — The large chamber on the lower left side of the heart. The left ventricle sends blood to the aorta and the rest of the body. Mitral stenosis — Narrowing or constricting of the mitral valve, which separates the left atrium from the left ventricle. Pulmonary — Referring to the lungs and respiratory system. Drug therapy could include morphine, nitroglycerin, diuretics, angiotensin-converting enzyme (ACE) inhibitors, and vasodilators. Vasopressors are used for cardiogenic shock. Morphine is very effective in reducing the patient's anxiety, easing breathing, and improving blood flow. Nitroglycerin reduces pulmonary blood flow and decreases the volume of fluid entering the overloaded blood vessels. Diuretics, like furosemide (Lasix), promote the elimination of fluids through urination, helping to reduce pressure and fluids in the blood vessels. ACE inhibitors reduce the pressure against which the left ventricle must expel blood. In patients who have severe hypertension, a vasodilator such as nitroprusside sodium (Nipride) may be used. For cardiogenic shock, an adrenergic agent (like dopamine hydrochloride [Intropin], dobutamine hydrochloride [Dobutrex], or epinephrine) or a bipyridine (like amrinone lactate [Inocor] or milrinone lactate [Primacor]) are given. Most patients with pulmonary edema who seek immediate treatment can be treated quickly and effectively. Cardiogenic pulmonary edema can sometimes be prevented by treating the underlying heart disease. These treatments, can including maintaining a healthy diet, taking appropriate medications correctly, and avoiding excess alcohol and salt. Sacchetti, Alfred D., and Russel H. Harris. "Acute Cardiogenic Pulmonary Edema: What's the Latest in Emergency Treatment?" Postgraduate Medicine 103, no. 2 (February 1998): 145-166.
edema of lungs usually resulting from mitral stenosis or left ventricular failure. the accumulation of extravascular fluid in lung tissues and alveoli, caused most commonly by congestive heart failure. Serous fluid is pushed through the pulmonary capillaries into alveoli and quickly enters bronchioles and bronchi. The condition also may occur in barbiturate and opiate poisoning, diffuse infections, hemorrhagic pancreatitis, and renal failure and after a stroke, skull fracture, near-drowning, inhalation of irritating gases, and rapid administration of whole blood, plasma, serum albumin, or IV fluids. See also pleural effusion. observations Signs and symptoms of pulmonary edema include tachypnea; labored, shallow respirations; restlessness; apprehensiveness; air hunger; cyanosis; and blood-tinged or frothy pink sputum. The peripheral and neck veins are usually engorged, blood pressure and heart rate are increased, and the pulse may be full and pounding or weak and thready. There may be edema of the extremities, adventitious breath sounds in the lungs, respiratory acidosis, and profuse diaphoresis. interventions Acute pulmonary edema is an emergency condition requiring prompt treatment. The patient is given oxygen and placed in bed in a high Fowler's position, and IV morphine sulfate is usually administered immediately to relieve pain, to quiet breathing, and to allay apprehension. Morphine also acts as a pulmonary vasodilator. A cardiotonic, such as digitalis or DOBUTamine, and a fast-acting diuretic, such as furosemide or bumetanide, may be given. Oxygen may be ordered. While the patient is acutely ill, the blood pressure, respiration, apical pulse, and breath sounds are checked frequently or continually monitored. Parenteral fluids, if indicated, are infused slowly in limited quantities; a low-sodium diet is served; and the patient's intake and output of fluids are measured. The patient is weighed daily, and any sudden weight gain is noted and reported. nursing considerations The nurse provides continued care and emotional support and directs the patient to exercise to tolerance with frequent rest periods, to report any symptoms, to avoid smoking, and to follow the regimen ordered for medication, diet, and return checkups. Lung water, water in the lung Internal medicine The exudation of protein-rich fluid due to heart failure–eg, left ventricular failure, aortic or mitral valve stenosis, post-MI, or high altitude Management Furosemide. See Congestive hear failure. Accumulation of extravascular fluid in lung tissues and alveoli usually resulting from mitral stenosis or left ventricular failure. n the accumulation of extravascular fluid in lung tissues and alveoli, caused most commonly by congestive heart failure. pertaining to the lungs, or to the pulmonary artery. See also lung. causes a syndrome of chronic toxemia, cough, loss of body weight. Careful auscultation may elicit squeaky rales around the lesions. See also caudal vena caval thrombosis, aspiration pneumonia. basic structural unit of the lung parenchyma; the gas exchange unit, supplied by a single terminal bronchiole and includes branches of the terminal bronchiole, alveolar ducts, alveolar sacs, alveoli and associated blood vessels. A pulmonary lobule consists of many acini. incompatible with life; found only in fetal or neonatal necropsy specimens. include epithelial cells (pneumonocytes or pneumocytes), alveolar capillary endothelial cells, and interstitial cells (fibroblasts) and alveolar macrophages. a disease of unknown etiology marked by chronic filling of the alveoli with a proteinaceous, lipid-rich, granular material consisting of surfactant and the debris of necrotic cells. the network of capillaries in lung tissue. see ovine pulmonary adenomatosis (below). the circulation of blood to and from the lungs. Deoxygenated blood from the right ventricle flows through the right and left pulmonary arteries to the right and left lung. After entering the lungs, the branches subdivide, finally emerging as capillaries which surround the alveoli and release the carbon dioxide in exchange for oxygen. The capillaries unite gradually and assume the characteristics of veins. These veins join to form the pulmonary veins, which return the oxygenated blood to the left atrium. See also circulatory system. a measure of the ability of the lung to distend in response to pressure without disruption. Expressed as the unit volume of change in the lung per unit of pressure. Compliance or distensibility of the lung is increased in conditions such as emphysema in which the lung distends more readily, and is decreased in fibrotic conditions in which the lung distends with difficulty. See also compliance. caused by engorgement of the pulmonary vascular bed and it may precede pulmonary edema when the intravascular fluid escapes into the parenchyma and the alveoli. There is a loss of air space and the development of respiratory embarrassment. may be congenital or acquired, caused by trauma, parasites (Paragonimus spp. ), or associated with bronchiectasis. Rarely, metastatic tumors cavitate forming cysts. include aerodynamic filtration in nasal cavities, sneezing, local nasal antibody, laryngeal and cough reflexes, mucociliary transport mechanisms, alveolar macrophages, systemic and local antibody systems. an effusion of serous fluid into the pulmonary interstitial tissues and alveoli. Preceded by pulmonary congestion (see above). 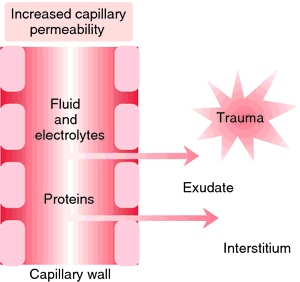 If the extravascular exudation is sufficiently severe a critical level of hypoxia may be reached. The breathing will then be labored, the normal breath sounds on auscultation may be absent, and a frothy nasal discharge, often blood-tinged, may appear. At this stage the animal's life is about to terminate. obstruction of the pulmonary artery or one of its branches by an embolus. The embolus usually is a blood clot swept into circulation from a large peripheral vein. Signs vary greatly, depending on the extent to which the lung is involved. Simple, uncomplicated embolism produces such cardiopulmonary signs as dyspnea, tachypnea, persistent cough, pleuritic pain and hemoptysis. On rare occasions the cardiopulmonary signs may be acute, occurring suddenly and quickly producing cyanosis and shock. A septic embolus can lead to local pulmonary abscess or an extension to pneumonia as in caudal vena caval syndrome. See also caudal vena caval thrombosis, pulmonary abscess (above). a lesion common in heartworm disease; eosinophiles and neutrophils surround trapped microfilariae causing nodules as large as 3 inches diameter. May be preceded by lesions of allergic pneumonitis. traces of blood can be found in about 60% of horses after racing. Less than 1% of these bleed from the nostrils. See also epistaxis. tests used to evaluate lung mechanics, gas exchange, pulmonary blood flow and blood acid-base balance. Pulmonary function testing is used to detect emphysema and chronic obstructive bronchitis at an early stage. as distinct from hemothorax, is recognized because of a syndrome of dyspnea, increased lung density radiographically, and hemorrhagic anemia. If a large vessel ruptures into an abscess cavity there is usually a massive hemoptysis and instant death. Frothy blood-stained nasal discharge is an indication of pulmonary edema rather than of pulmonary hemorrhage. See also exercise-induced pulmonary hemorrhage (above). the predominantly pulmonary form of african horse sickness. a congenital defect resulting in decreased lung development. see pulmonary infarction, pulmonary embolus (above). includes accessory lungs, pulmonary hypoplasia, pulmonary agenesis, congenital pulmonary cysts, endodermal heteroplasia, respiratory distress syndrome, neonatal maladjustment syndrome, immotile cilia syndrome. includes aspergillosis, mortierellosis, blastomycosis, cryptococcosis, coccidioidomycosis. many types are recorded in all species but the prevalence is very low in food animals. A common site for metastases in companion animals. Characterized clinically by decreased exercise tolerance, progressive dyspnea, chronic cough and emaciation. Most diagnoses result from radiographic examination of the thorax for secondary growths. results from head trauma, central nervous system lesions and toxins, which may cause increased pulmonary blood pressure and alteration to sympathetic innervation leading to fluid leakage from vessels. a very chronic progressive pneumonia of sheep and goats caused by a retrovirus. Dyspnea, emaciation and a profuse nasal discharge are the cardinal signs, but coughing is not evident. The disease is always fatal. It is of great importance if it occurs in flocks that are housed for long periods. Characteristically the extensive lung involvement includes large areas of neoplastic tissue. Called also jaagsiekte, pulmonary carcinomatosis. see alveologram pattern, bronchial pattern. edema, emphysematous bullae and serosanguinous fluid in the airways with generalized pulmonary capillary endothelial damage; associated with chronic pulmonary collapse and removal of pleural effusions or pneumothorax with rapid re-expansion. traumatic, especially when there is rib fracture, or spontaneous due to coughing and a weak parenchyma. The most common cause of pneumothorax. thromboembolism causing blockage of large sections of the pulmonary vascular bed will result in at least temporary severe dyspnea. It may also lead to right heart congestive failure, i.e. cor pulmonale. the pocket-like structure that guards the orifice between the right ventricle and the pulmonary artery. causes right ventricular hypertrophy and a poststenotic dilatation of the pulmonary artery. There is a systolic murmur and thrill on the left side of the chest. A common congenital defect in dogs. the large vein (right and left branches) that carries oxygenated blood from the lungs to the left atrium of the heart. Acute MR is a medical emergency presenting with acute pulmonary oedema and hypotension and is usually caused by endocarditis, myocardial infarction with papillary muscle rupture or spontaneous rupture of the chordae. The acute pulmonary oedema developed by our patient, with the benefit of invasive monitoring and meticulous fluid management, is believed to have been induced by the transient increase in intravascular volume caused by 'uterine autotransfusion' following uterine contraction after delivery of the baby. State pathologist, Eleni Antoniou carried out a post-mortem and said the cause of death was an acute pulmonary oedema. A post mortem revealed he died of acute pulmonary oedema - a build-up of fluid on the lungs probably caused by a heart attack. A postmortem yesterday revealed Stephen died from natural causes due to acute pulmonary oedema, a build-up of fluid on his lungs. This (renal failure) had aggravated the acute myocarditis, resulting in acute pulmonary oedema or lung congestion. Acute pulmonary oedema and early lung damage may occur within a few hours of acute severe exposure. Autopsy reports in Majorca have confirmed that Stephen suffered an acute pulmonary oedema - or sudden build up of fluid in the lungs - thought to have been caused by a heart attack. A postmortem yesterday revealed he had died from natural causes due to acute pulmonary oedema, a build-up of fluid in his lungs. Autopsy reports in Majorca have confirmed that Gately suffered an acute pulmonary oedema - or sudden build up of fluid in the lungs - thought to have been caused by a heart attack. X-rays have revealed they suffered acute pulmonary oedema, the medical term for a build-up of fluid in the lungs.